It is intriguing to attempt to understand Hopper’s decision to elope to the Republican Party in the first place, when one recalls his role within the 1960s radical movements. Theoretically, after years spent in a drug and alcohol haze, Hopper, suddenly saw what had changed. By the 1980s, the 1960s dream of love and peace had crumbled into a nightmare of self-indulgence and greed. Hopper’s generation had either burnt out or the stoners and supposed radicals had switched to becoming CEOs of America’s major corporations making big money and living what was now deemed to be the American Dream (Steve Jobs springs to mind). And certainly the attainment, or the souring, of the American Dream is a key element of Hopper's identity. Capitalism, Republicanism, and their grating relationship with 1960s idealism is a theme that is explored in the road-movie comedy Flashback (1990). Hopper portrays 1960s activist hippie and now fugitive Huey Walker, whom after spending thirty years on the lam for a childish political stunt, hands himself over to the FBI and is arrested. The film is set at the beginning of the 1990s and takes a swipe at the Reagan era of free enterprise and capitalist greed but also ruthlessly comments on the 1960s generation who sold out. FBI agent John Buckner (Kiefer Sutherland) escorts Walker via train to face trial for his past crimes. Whilst eating in the train’s restaurant carriage Walker tricks Buckner into thinking he has spiked his water with LSD and convinces him that drinking copious amounts of tequila will counter the effects of the drug. Buckner takes the hippie's advice, then passes out drunk. Walker shaves off his shaggy beard, cuts his long hair short, and switches clothes with Buckner. 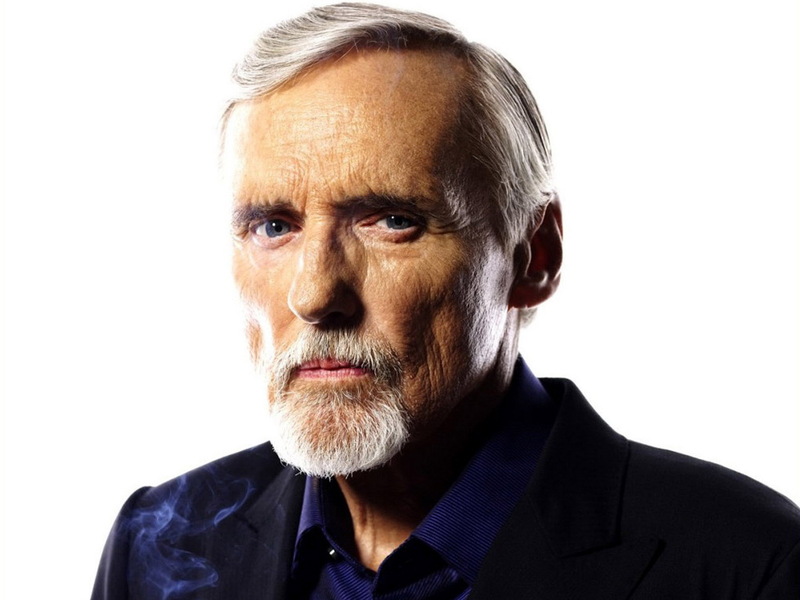 He changes from 1960s Dennis Hopper to 1990s Dennis Hopper before our eyes. When they arrive for a layover stop in a small town, Walker, taking on the FBI role, hands over a passed-out Buckner to the local sheriff. Walker then decides to have a drink in a local bar where he finds two middle-aged males drinking lots of beer and reminiscing about the 1960s. Walker inquires about their rebel credentials and informs them that Huey Walker has been caught by the FBI and is rotting in the jail across the street. The two men are furious. Walker mocks them, delivering the line: “It takes more than going down to your local video store and renting Easy Rider to be a rebel,” to which one of them replies, “I happen to own Easy Rider.” The middle-class guys from the bar decide to kidnap Walker (who they still believe is Agent Buckner) and call the local sheriff to arrange a prisoner exchange. When the exchange takes place, Walker and Buckner agree that the sheriff (who allowed a fellow inmate to give Buckner a beating) will try to silence them no matter what. They make an escape and the two foes (personal and generational) become unlikely comrades. It turns out that the straight-laced Buckner grew up on a local hippie commune as a child. His apparent switch to a cold FBI agent was a reaction to what he perceived as his parents’ failure to grasp reality. By the end of the film, the roles in which Walker and Buckner played have been switched, at least aesthetically, for real. Buckner quits the FBI and hits the road on a motorcycle in a search of freedom, whilst Walker, sharp-suited and loaded with cash from his autobiography sales (his capture was a publicity stunt to generate sales of his book), cruises round town in a limo, claiming capitalism is the way and that "greed is good." There is nothing overtly political in content about Flashback, yet by casting Hopper as 60s throwback Huey Walker the movie creates an echo of Hopper’s former persona. To have the character then turn his back on those ideals is a fitting mirroring of Hopper’s own journey towards voting Republican. Moving to the right didn't seem to make Hopper lose his sense of what was right or wrong in terms of social justice. Reagan’s arrival into office meant that Hollywood’s era of social commentary came to an abrupt end. The otherwise liberal players from the New Hollywood era were sidelined in favor of big budget action flicks that promoted unethical use/abuse of corporate and militaristic power. Cinematographer Haskell Wexler stated that Hollywood movies were guides to “screw each other over, kill each other and rip each other off." Still, a number of films did sneak under the radar of conservative Hollywood. A standout was Hopper’s own directorial film Colors (1988). Colors was a document of the Los Angeles African-American and Latino gang experience, but it also represents a deeper problem inflicted upon urban youth by Reagan’s policies. In 1983, the administration made cuts to federal funding for employment training that was seen as a lifeline for urban youth to better themselves and escape their troubled neighbourhoods. These cuts left poor and predominantly African-American youths stranded and reliant on drugs and violence to get by. Quart and Auster argue, "During the Reagan years many of the black economic and social gains of the 1960s and 1970s, ranging from the rate of college attendance to the proportion of two parent families to relative income levels, began to decline while poverty and crime rates escalated." The disenfranchised youths found bonds within gang culture. Colors is an analytical representation and a reflection of the policies inflicted upon black communities in the 1980s by the Reagan administration. Hopper produced one of the most politically potent films of the 1980s. The fact that he was a Republican backer at the time was something of a moot point. As someone who openly admitted he voted for Bush, Land of the Dead becomes a subversive film for Hopper to appear in. Firstly, Hopper is playing a credible leader and an authority figure that blows apart his anti-authority status of the 1960s. Kaufman is powerful, wealthy, and despises anybody who is below the class structure that he has created. The "upper-class," of which he is part, live in luxury; the "middle-class" consist of those brave enough to protect and surround the monolithic high-rise, and outside of the compound are the "underclass," the zombies, left to their own devices. Secondly, Hopper dishes out some choice dialogue that directly imitates Bush Jr. For example, in one pivotal scene, Kaufman proclaims: “We do not negotiate with terrorists” - a statement that the Bush administration repeatedly used in its War on Terror propaganda drive. Kaufman also views his troops as disposable: he sends them on deadly errands and orders them to quash the zombie hoard in order to protect his privilege and that of his class—a shrewd conception of the Bush administration’s careless deployment of troops in Iraq. A few years later, Hopper teamed with Republican backers Kelsey Grammer and Kevin Costner for the comedy Swing Vote (2008). The film’s premise of an election decided by the vote of one man allowed left and right to play off against one another in comedic circumstances. Grammer’s character, the Republican incumbent Andrew Boone, vies for Costner’s vote against Hopper’s democratic nominee, Donald Greenleaf. The film shows the ever-shifting policies of the left and right to achieve votes and gain popularity. The fact that three Republican backers played the central roles was somewhat telling of the tone of the film. Though Swing Vote is soft in comparison to the left-bashing An American Carol (2008), which featured Grammer as General George S. Patton and Hopper as a judge who takes a shotgun to a hoard of zombie ACLU lawyers. Subtlety was not its strong point. Swing Vote could be considered a revelation for Hopper that the right just wasn't where it was at. Much to his dismay, Hopper's performance was subject to a number of editorial cuts which dispensed with a character-defining subplot. In a number of promotional interviews, Hopper actually criticized the film, stating, “My subplot was completely cut. There’s a scene we shot where I ditch all my events to go support a young Mexican waitress at the funeral of her grandfather. It was chopped.” The scene itself is included on the DVD extras of Swing Vote, and although the scene didn't fit well within the comedic context of Swing Vote, Hopper does deliver a strong performance which, if it had been incorporated into the film, might have provided his character with far more credence. With the advent of Barack Obama, Hopper’s decision to return to his Democratic roots was not difficult to fathom. At the time, people had become reinvigorated with American politics by Obama’s charm, optimism, and proposal for change. People saw in Obama a fresh approach to foreign policy, a set of values and ideals that harked back to the civil rights movements, and a passing political resemblance to the aspiration that John F. Kennedy and his brother Robert F. Kennedy once promoted. In response to Obama’s rise, John McCain’s Republican campaign and the conservative media could only conjure up race-based allegations of Obama’s ancestry and birthplace, his acquaintance with proposed radicals, and his religious orientation. Paired with McCain's running mate, Sarah Palin’s unease and inexperience with seasoned political commentators, the right began to look outdated and irrelevant. Hopper’s decision to switch allegiances in the early 1980s was based on his assumption that the nominees had America’s best interests at heart. Hopper, after all, was always a patriot who was critical of America when required yet also vocally supportive. However, Hopper’s conservatism (and patriotism) was on display well before he began voting Republican. In fact, a pivotal scene in the counterculture classic Easy Rider is telling. ACLU lawyer George Hanson (Jack Nicholson) states out aloud that "this used to be a helluva good country." This is a misconception that many politicians of the right (and even sometimes the left) seem to believe - that America was once this great nation that somehow lost its way. There are echoes of this in current Republican candidate Donald Trump's campaign slogan to "Make America Great Again." Trump, and the right, wish to return to a mythical version of American history. As discussed in the York Film Notes for Easy Rider, Hanson's referral is to "the imaginary golden age of freedom and self-fulfilment which historically never was." In a 1972 interview with Gallery, Hopper poignantly expressed his concerns: "I look at America today and I really wonder how much longer a society like ours can exist. How much longer can we have wars, how much longer can we keep raising our national debt and shaking our missiles before it all falls apart? What’s wrong with the country is that we’ve forgotten how we started, which was to have a government of the people, by the people, and for the people - and that the people then have to approve and support that government." Whilst this interview took place in 1972, Hopper could have been talking about a contemporary America. He may have backed the wrong side in a government that was less about the people and more about big business and external conflicts. Yet Hopper always seemed aware of America’s deep-rooted problems and remained adamant that America could be fought for - from the left or the right.